My family recently relocated to Louisville, KY and we are in the process of finding a new church home. At one particular church we visited, we happened to attend on a Sunday when the church was hosting a fifth Sunday brunch. While we were eating our pancakes, a handful of children had made their way to a table, where they appeared to be doing some sort of craft project. When we finished breakfast, someone from the church invited my children to the “craft” table to design a bag. What had appeared to be a craft project, was actually an ongoing project of the church in which children decorated paper bags with hopeful messages and then added snacks and a bottle of water. The children then gave the paper bags to their parents to keep in their vehicles for homeless persons or other persons who might be in need. After I chuckled to myself about the gusto with which this little one mimicked an adult – likely a parent – I began to reflect on what the little girl had said and the predicament it seems to leave many of us in: We want to help, but we don’t want to be enablers of alcoholism or addiction, laziness, or any other behaviors we deem to be bad or inappropriate. For many, care packages or gift cards seem to be the moral middle ground between the desire to be charitable and the desire not to enable. And yet, the Gospels tell us to take care of those in need; period. The Gospels tell us to take care of those in need – whatever that need might be – regardless of their past (Zacchaeus, Mary Magdalene, Centurion), regardless of their present (Good Samaritan, Feeding of the Multitudes, Matthew 25, anyone who was/is physically or mentally disabled), and regardless of where their decisions are leading them (Peter’s denial, Judas’ betrayal). It seems to me the most important thing to Jesus is not that we are charitable, but that we are loving; and there is a big difference between the two. If we are merely being charitable, it’s much easier to make our generosity conditional. However, if we lean into love, then being charitable nearly always means erring on the side of compassion; whether it’s food or forgiveness, clothing or comfort. 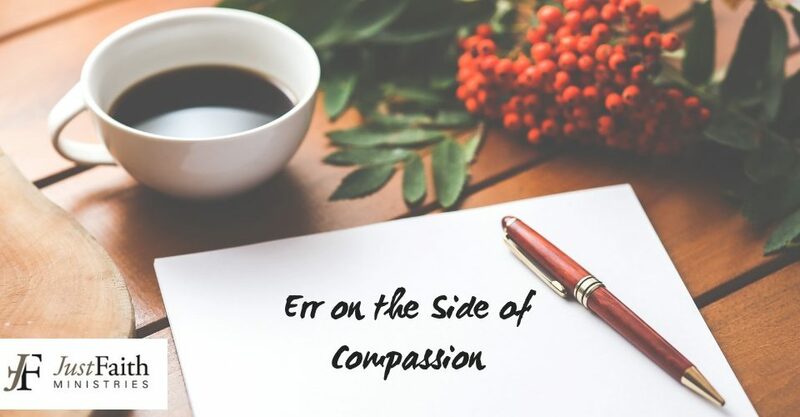 I’ll admit this response may be somewhat naive, as there were many days when erring on the side of compassion was very, very difficult and I desperately wanted to trust my own judgements and lean into my assumptions. Instead, my faith compelled me then – and continues to compel me today – to care for the poor and support those in need, period; to let go of my desire to write the ending to other people’s stories, and instead turn the pen back over to God.